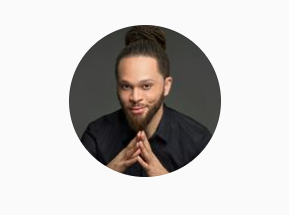 The NFL Players Association Will Hold A Special Event During Super Bowl Week Where Kat Tat Will Lead An Instructional Painting Class For Minneapolis High School Students. Katrina ‘Kat Tat’ Jackson made her mark as an artist at while still in high school at the age of 16! Read more about her story HERE! Katrina ‘Kat Tat’ Jackson, ​Super bowl-winning ​defensive back ​Duane Starks​, former ​Washington Redskins​ All-pro kicker ​Chip Lohmiller​, and several other former NFL Players including ​Brandon Archer, Peter Campion, Cliff Crosby, Omar Gaither, Bradie James, Jon Melander,​ and many more! 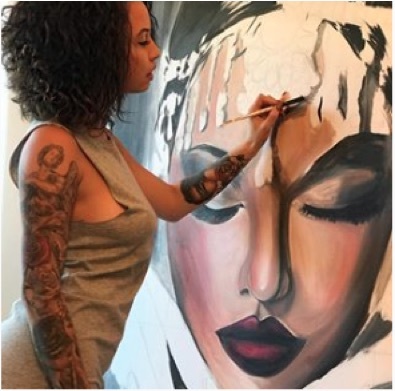 If you were asked to provide an opinion about the artwork of Painter, Katrina Jackson, you may have to search the name, but what if you were asked about that tat-girl, Kat Tat? Kat Tat, from VH1’s hit reality series Black Ink Crew Chicago? 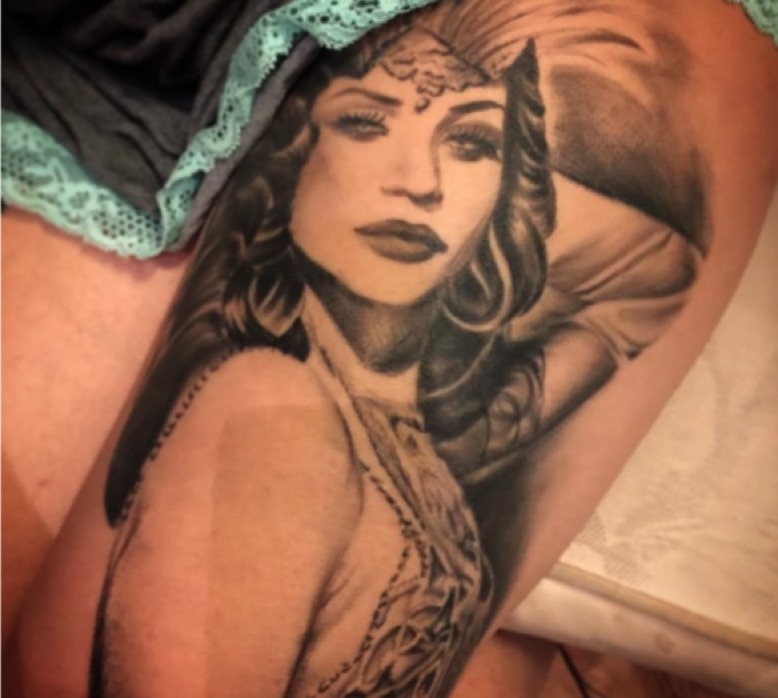 Or Kat Tat, the tattoo artist who went viral after tattooing a portrait of a vintage burlesque dancer on her own thigh? Jackson is an artist -a painter and tattoo artist. A fact solidified over a decade ago when the, now, 27 year old entered an art show at the age of 16. Jackson recalls the childhood experience that helped shape she today. 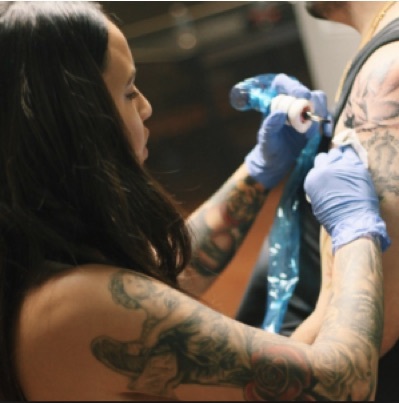 Flying to Florida served as an eye opener to her talent, but a broken heart would spur on her love for painting and tattoo art and tattooing -earning her the nickname Tat Girl. “Going into my senior year is when I got the interest in tattooing, and when I really stepped out and started finding myself. I had this boyfriend that I was madly in love with. I thought my life would just be being this guys wife and my senior year in high school is when I had my first break up -my first heartbreak. Jackson found her love and passion for painting and tattooing taking over and her grades quickly fell to the back burner yet again. On the other hand, due to her determination and work ethic, her artistry was taking her to places beyond her wildest dreams. “I tried to go off to college, but found my passion in art and tattooing and I took a risk to make that my career and I made it happen. I don’t really believe in being a starving artist. It may not even be art that’s your passion, but whatever your passion is, it’s important to go out and chase and it and really make it work for you! I’m out here trying to get it and inspire girls that are just like me. I’m just a very very hard working artist,” she says. 2015 was an explosive year for Jackson, showcasing two shows at Miami’s Art Basel and making her television debut as part of the 9Mag Tattoo Studio crew on Black Ink Crew Chicago. She explains what it was like having two exhibits in Miami’s Art basel and the inspiration brought on by that experience. Art is therapeutic for most, Jackson shares with us which creative style is more therapeutic when comparing painting and tattooing. Jackson explains the importance of sensual and sexual artistic expression, and owning it. Jackson has to proven herself as an artist since high school, quickly rising to fame with 9Mag and Black Ink Crew Chicago. With fame comes with money, power and influence. Jackson details how fame and the experiences that come along with it have affected her artistically? As for the future, Jackson will continue tattooing portraits and black and gray realism, but plans on learning a new-school “neo traditional” type method of tattooing. And if you want a “tat” from Kat? Kat’s latest paintings, modeling pictures and her portfolio can also be found at www.kattatgirl.com. 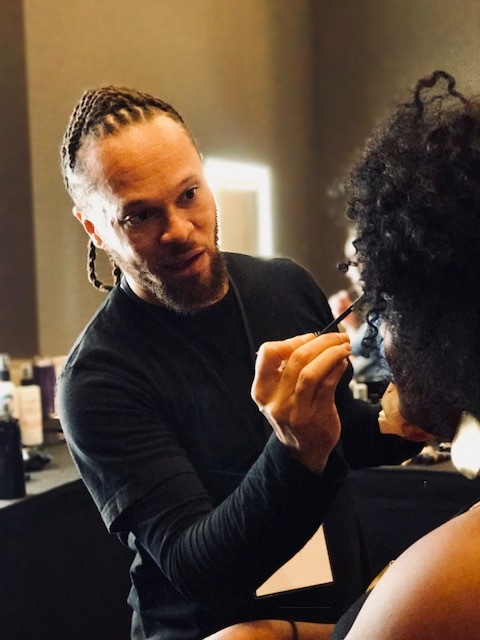 There aren’t many people who can honestly say, “I love what I do,” but there are a few and celebrity MUA, Frederick Sanders is one of them. His looks have graced red carpets, album and magazine covers, and been seen center stage on host of celebrities; Regina Hall, Shirley Cesar, MC Lyte, The Clark Sisters, Robyn Dixon, Avery Sunshine and Tamela Mann to name a few and is known for his “anointed hands.” I caught up and spoke to Sanders about who he is on a personal level, his career as a makeup artist and what the future holds for “Fred4Face“. On a typically warm, fall night in Dallas at the swanky Design District apartment skyrise clubhouse amoungst outstanding views while enjoying the sounds of DJ Luqwon, I had the pleasure of watching Saunders work his magic on “The Chain Breaker” herself, Speaker, Author and Philanthropist, Dr. Catrina Pullum. “I’m the guy that’s behind the scenes. 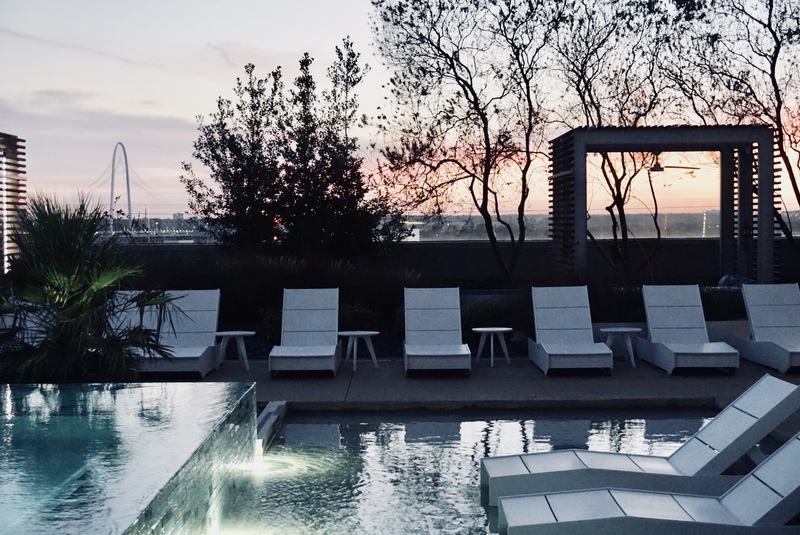 People know my work and name, but not necessarily my face,” he explains as he enters the clubhouse modestly, charmed and flattered that the Concierge recognized him on sight and greeted him with excitement. Seems like he’d set up and was ready to roll by the time he finished that sentence. SheBatty: I read that you were preparing for law school and walked into MAC and got hired on the spot. 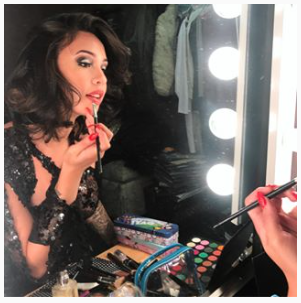 So have you always been artistic or were you practicing makeup at that time, or do you just have it? “I’d like to think that I just have it. However, I did grow up being the only boy in a house full of sisters. So I think it just kind of fell on me -I inherited it, if you will, I was the youngest and the only boy. Seeing my great-grandmother, my grandmother, my mother and all of my sisters, you know, it kind of helped along. But I’d never had any desires to be a makeup artist. Those things sound so far from lawyer, but I guess we’re all multi-faceted. 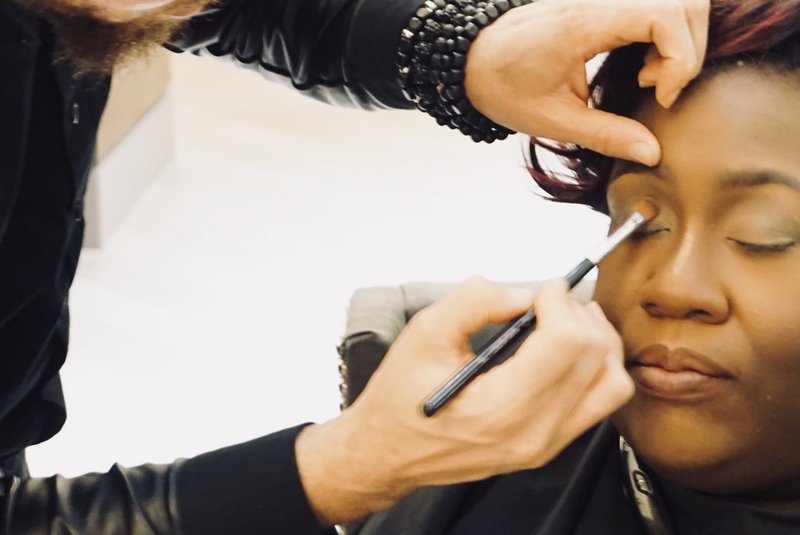 Did you know that makeup was your calling upon being hired at MAC? Now that you are an artist, what do you love about it? 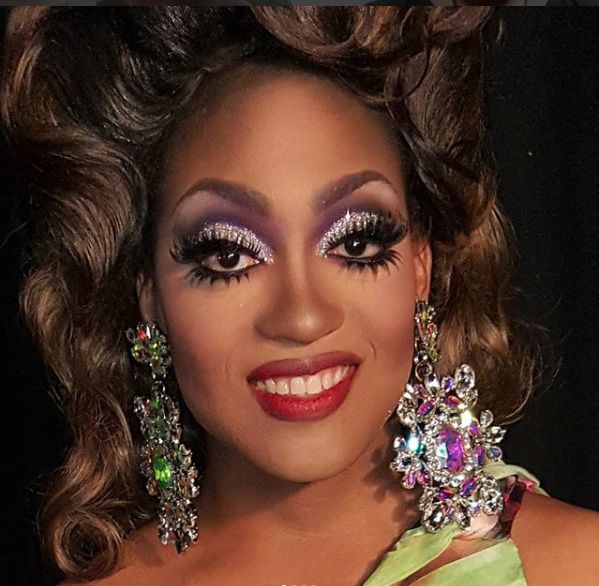 What’s your favorite bold looks that you’ve created or the most fun? 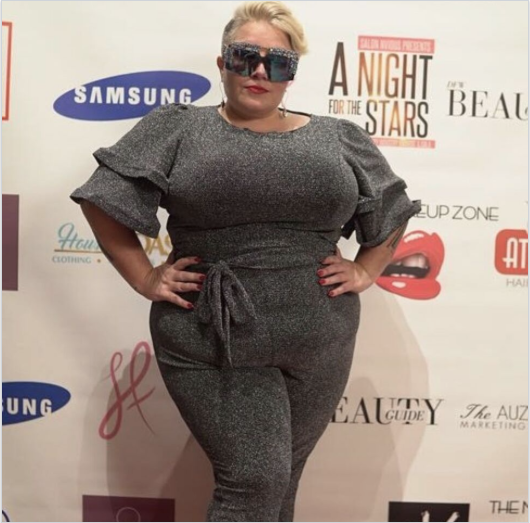 You are great at creating classic red carpet looks. Do you like to step outside of that and do bold looks? You just told me that you had a client who was conservative, and you had a little fun and it worked. Do you often do that -play up looks and have fun? What’s your go to brand? What’s your go to budget brand? What’s the one product that we can always find in your bag? What advice would you give aspiring MUAs? How do you feel social media has affected the industry? Who are you beyond the makeup? “I’m taking bigger faith walks. I’m actually stepping out of my box and trying to do something on a bigger level. Somethings that I never thought that I would even dream of accomplishing. Stepping out on the waters a little bit. Visit Fred4Face for booking information and to see more Sanders work. 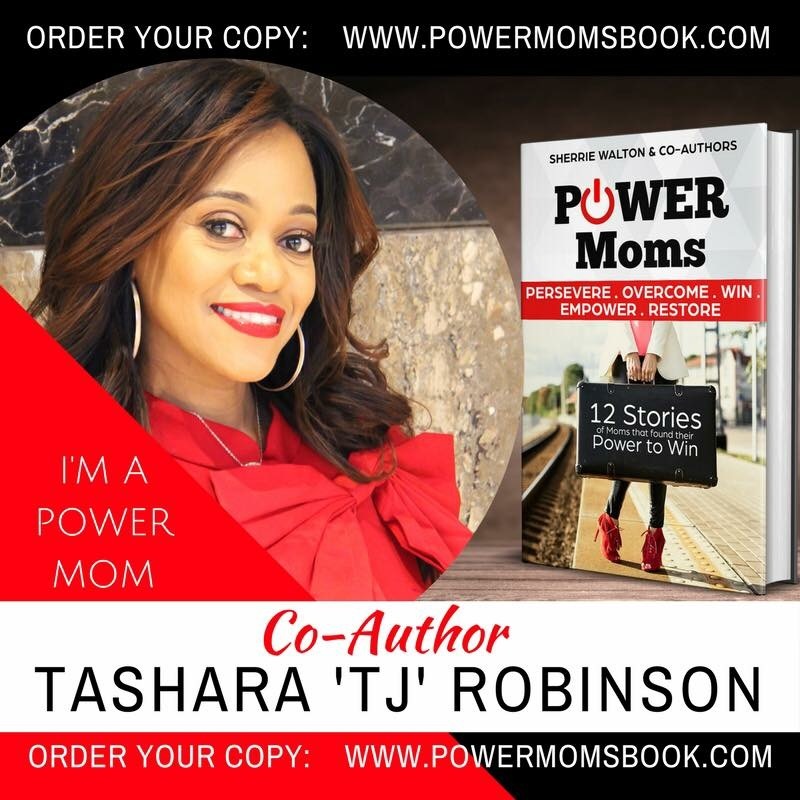 Meet Tashara ‘TJ’ Robinson, POWER MOM! 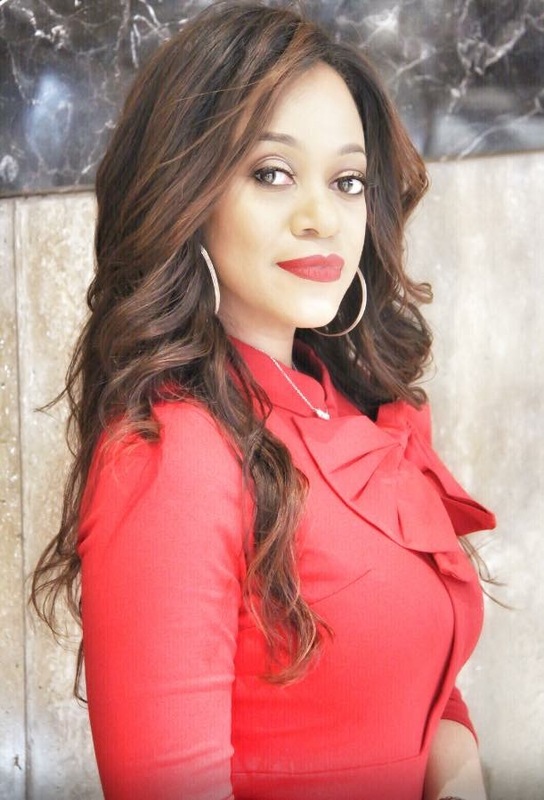 After more than a decade of “living the dream”, Dallas native, stay-a-home mother of four and wife, TaShara ‘TJ’ Robinson found herself in an unfamiliar space. 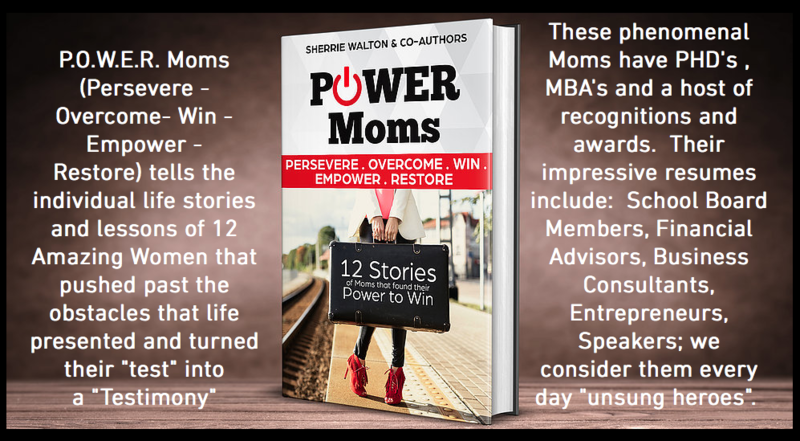 “To make a long story short, I ended up filing for divorce after 19 years of marriage,” she says the discussion about her contribution to the newly released POWER Moms book begins. “I met my husband at Texas A&M University and we dated for a few years. Got married, and I decided to be a stay-at-home mom -we had already had the conversation and decided that if we had kids, I’d stay home and raise the kids, and at the time I felt like that was the best decision for me. I wanted to just, you know, be a mom -be a good mom, and I wanted to be a good wife as well. And you know, even as noble as that desire sounded, I found that I still had to deal with real life and a real marriage,” she says. 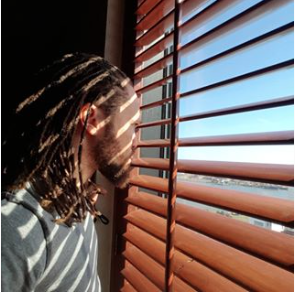 It’s easy to feel alone when faced with adversity, but Robinson explains that, “I find that I have an -unfortunately, it’s not an uncommon story. So, I am encouraging people who have experienced any type of loss. My loss, in particular, was a divorce. So I’m just sharing all the wisdom I have learned,” she says. ”There was a lot of journaling where I was processing a lot of decisions that I knew I would have to make. 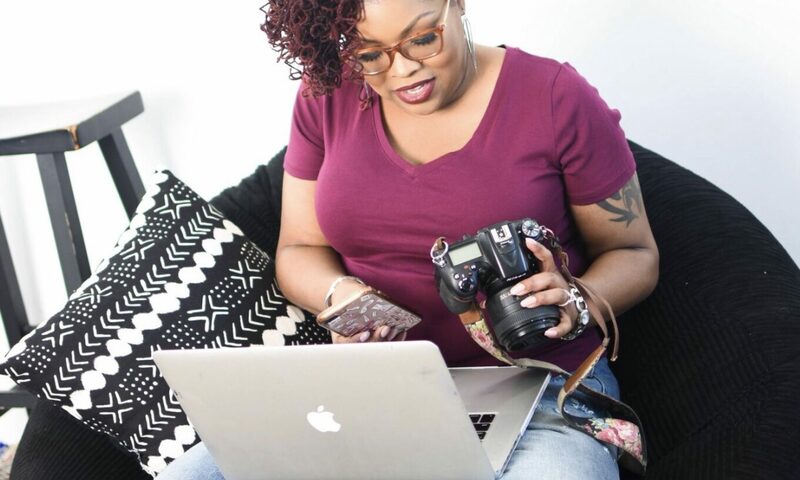 The journaling, for me, is what helped me come to that decision and even after the divorce, there was still a lot of adjustment with my children and family and friends and -wow, I felt like I just had get it out,” she says. 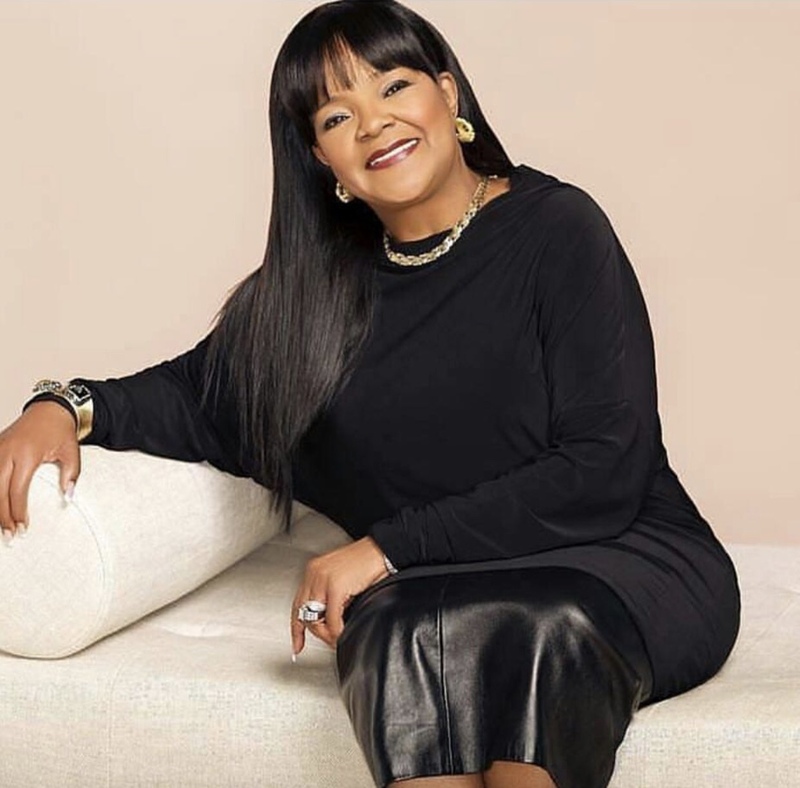 Through the POWER Moms book, Robinson provides a glimpse into what she had to overcome and shows that, “Hey, everything can look good, but yet there are still some difficulties,” she says. “The years leading up to that divorce, and, even now it’s been two and a half years, I’ve had a lot of introspection time where I actually had to decide for myself how I wanted my life to go and run and operate,” she says. She recalls being compared to the Obamas from those on the outside looking in and says, “I thought to myself that they [the Obamas] would be mad with y’all comparing us to them! No, ma’am!” Because everything and everyone who looks good on paper is good, right? “To be clear, the 19 years weren’t all bad. We have four beautiful children who are emotionally healthy and physically healthy that I’m extremely proud of,” she says. Be assured that her story does not end there. The best part of Overcoming obstacles and adversity is most definitely the Win! In reflection of the journey, and while working on POWER Moms, Robinson came to realizations and discovered Empowering things about herself. “Obstacles act as an astringent, they bring things out of you. I realized that I operated in a lot of fear. I was afraid…of a lot of things. Like, I’ve been married for 19 years and I haven’t worked in so long. How am I going to make it? I have four kids! How am I going to do that? Can I do this? I don’t know! So, the fear and the self-doubt I dealt with, but what I also found me,” she says. “Like, ‘Ok, you might be scared, but we g’on [sic] figure it out!’ That’s what this drew out of me so, I’m not afraid to move past that fear anymore. That’s where I am right now and that’s what that obstacle drew out of me,” she says. Contact www.phenixx.com to book POWER Mom Co-Author Tashara Robinson. To learn more about Tashara (TJ) Robinson and any upcoming projects visit www.tasharatjrobinson.com.